Imagine the relationship triangle from “East of Eden” and set it deep in the Appalachian Mountains. Add a couple of ghosts, a good measure of dysfunction, and a whole lot of twists and turns, and you have Ann Hite’s new Black Mountain novel, SLEEPING ABOVE CHAOS. Hite’s fourth novel returns to Swannanoa Gap, a small town at the foot of Black Mountain, and introduces new characters while revisiting some favorites from her previous novels. Buster and Lee Wright are the sons of Swannanoa Gap’s sheriff. Their personalities couldn’t be more opposite and these differences bring conflicts that may not be resolved. Ella Ruth Allen was born on Black Mountain. Her mama, a city girl, runs off with another man, leaving the two-year-old Ella Ruth behind with Paul Allen, her father. He in turn promptly dumps poor Ella Ruth on her grandparents’ farm to be raised by Grandmother Allen, a woman who has an extreme dislike for her wild, runaway daughter-in-law. Hite weaves a ghost story throughout each of her novels and this one is no different. Ella Ruth follows a haint into the woods near the farm and stumbles onto her family history. When her life crosses paths with Buster and Lee Wright, fireworks explode. The reader will travel to a ranch in Montana, to Pearl Harbor, and to the beaches of Normandy on D-Day, while watching the cast of characters struggle through World War II, emerging into adulthoods which would weigh heavy on anyone’s shoulders. The story ends as the Civil Rights Movement ignites. Ann has magic in her writing in that she easily gives vision to the scene, the characters and their voices. I was completely hooked into Ella Ruth and Buster by the first chapters. I felt like I knew them. I wanted to hug them close and provide comfort to both. Ann brought them fully alive to me. 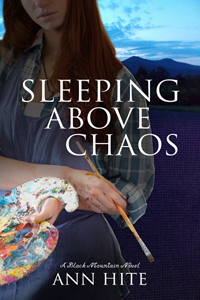 Ann Hite's novel, SLEEPING ABOVE CHAOS, leads her readers and follows her characters from Black Mountain and Swannanoa Gap into deep and perilous consequences from wasting love and cherishing hate. The chaos in the title is human. The sleeping are not as far above it as they think; they are about to wake. Hite’s characters do not choose hate instead of love. Sometimes they are born into it. Sometimes they grow into it. Sometimes they are driven to it, and sometimes they walk. There's no map. It is easy to get lost along the way, courting comfort or oblivion or revenge. “Love is for fools,” one character testifies, in favor of friendship. But the tangled loyalties, bloodlines, secrets, and silences in SLEEPING ABOVE CHAOS are deeper than friendship, more vital than blood. Hate is part of “the beautiful wreck” Hite's fictional people create, are created by, and witness. Hite’s fiction mirrors and reflects today's dreams and realities and what we make of our prejudices and heritage. We dare not look away.